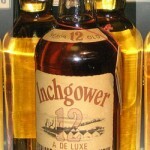 Inchgower is not a name you hear a lot when talking about whisky. You don’t hear about it on many peoples top ten whisky lists, and you definitely don’t see it in the supermarket, so I wondered what this enigmatic and mysterious whisky would hold when I started to open the pandora’s box of a whisky investigation and review. 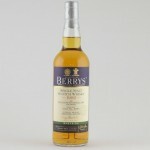 At first a little poking around on the web revealed a little more information about this whisky. And I was keen to know more, so as result this review turned into more of a research piece into Inchgower rather than a traditional review. If you just want you can just read the review. A lovely little Inchgower which we just had to bottle. This was distilled on the 30th June 1982, and it was aged in a single refill hogshead for 29 years before bottling on the 22nd November 2011. 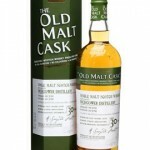 A release of just 190 numbered bottles, at natural cask strength. Diageo are the current owners of Inchgower distillery bit dint of Diageo owning Bells whisky. Bells whisky rather interestingly bought the distillery from a local council (Buckie) who acquired it following its liquidation in 1903. The word on the street is that Inchgower was originally built in 1871 to replace an older distillery called Tochineal About which I know very little. Tochineal was Founded 1824 by John Wilson and Closed due to shortage of water. Replaced by (moved to?) Inchgower Distillery. However I’m not going to linger on Tochineal, but I do wonder if any still exists. 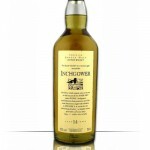 Inchgower is not usually sold as a single malt, and it is infact a major component of Bells blended whisky. 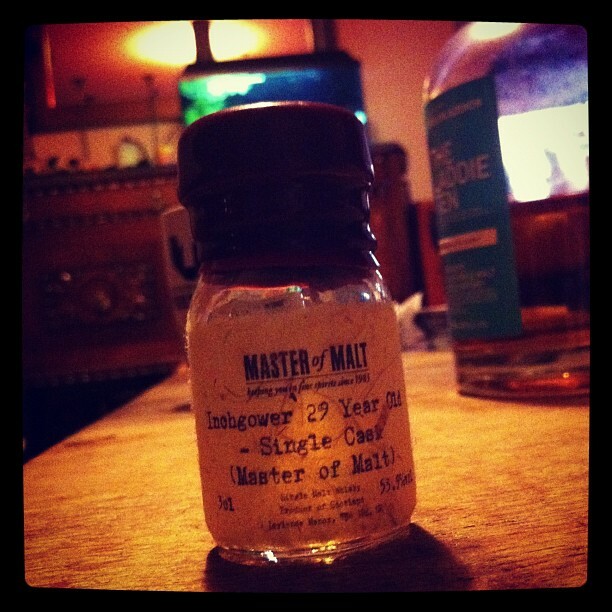 It has been been release as a single malt a number of times though. I suppose I better actually do this review then! This is a good one to take your time nosing because the aroma is so pleasant. I got sweet red candy rock, creamy toffee covered strawberry, and ‘probably imagined’ tiny hints of lavender. With a little water: the nose it muted by water but some spice does start to come through. Very Smooth, Easy going, warming without Burn, there is sweetness, a little malt, cherry and pears. My memory of this will be mostly of a spicy ginger that starts softly but builds and build to be quite punch of potent spice. Water is not the friend of Inchgower 29 single cask, even though its at 53.9% it doesn’t need it, nor is it welcome in my glass. To get the best out of this try it beside a younger dryer whisky for comparison, I used Laddie Ten (see the picture at the top). I like the Laddie Ten too, and found it gave an excellent counter point to this. Like I said earlier the spice comes through quite strong and builds as you drink more. The Spice dominates a medium long finish.